You won't want to leave home in this comfortable retreat that offers so many features, located in a park-like setting! 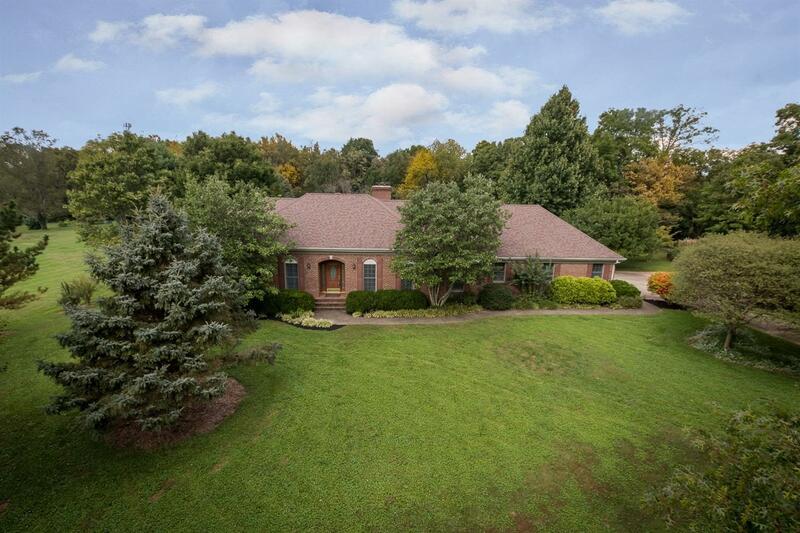 Brick 1 1/2 story on a peaceful 2.11 acres that is very private and quiet yet close to shopping and I-64. Granite counters and a stunning tile back splash greet you in the spacious kitchen with eat-in area overlooking backyard. Perfect for a little R&R, the sun room offers 3 seasons of enjoyment. Relax and unwind in a large, spa-like, first floor ensuite. A family room with gas logs, formal dining and living rooms, and two bedrooms comprise the rest of the first floor. Upstairs, there are two bedrooms and a full bath and a walk-in attic, perfect for storage. The basement is ideal for teenagers, entertaining visitors, or multi-generational living with a large family room with a masonry fireplace, a kitchen with two booths for fun eat-in dining, a full bath, a rec room and a bonus room. Lower garage has plenty of storage for riding mower and lawn equipment.